The January 4, 1959 issue of Parade magazine published a piece by Sid Ross titled, "Will Robots Make People Obsolete?" The piece in its entirety appears below in all its dystopian glory. Who knew that Parade could be so dark? The piece claims that in the future "mankind's major struggle will be against boredom, with the suicide rate zooming as people lose the race." The heaviness of the piece, along with the accompanying illustration, raise so many questions. Chief among them, why would a family of four gleefully jump into that menacing robot's mouth? Secondly, why would Father be fed an entire pumpkin? 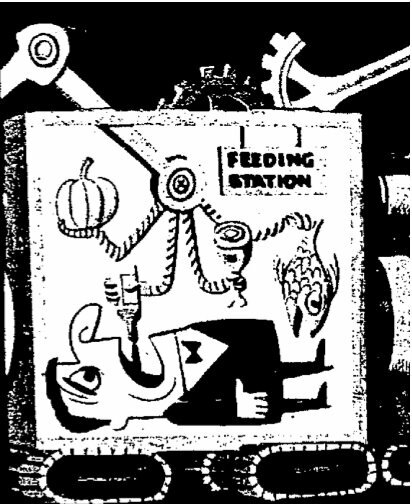 For that matter, why is this evil machine feeding him at all? Is Robo-Dog attacking Little Johnny for a reason? Maybe Johnny pulled Robo-Dog's metal tail one too many times. I'm willing to accept the possibility that Johnny deserves what's coming to him. Lastly, despite the abject horror on Mother's face, the robot servant appears to be doing a damn fine job. Baby is happy and there's no indication that supper is burning. Granted, we have to assume that Mother was less-than-gingerly placed into that trash can by Mr. Octo-Eyes. All over the world and on the colonies in outer space, everyone is excited about the most popular event of the year. All human activity stops as people breathlessly await the outcome of the world's championship tiddlywinks contest. In this world of the future mankind has little else to be excited about. For earth has been transformed into a "paradise" where incredibly clever robots take care of things. They do the farming, the factory work, run the trains, regulate traffic, enforce the law, cook the meals, clean the houses and distribute a vast wealth of goods and services to which every human being is entitled - merely by being alive. Mankind's major struggle will be against boredom, with the suicide rate zooming as people lose the race.Governments and family life will wither away. Public officials will be replaced by Board of Supervisors to "umpire" games, sports and recreation, and also administer competitive exams which would decide who could work at the few essential jobs left for human beings to do. Fantastic? Certainly, by our everyday standards of progress. 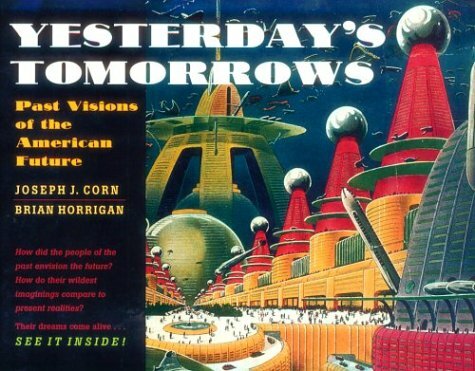 But every one of these dizzying pictures of life in the future could conceivably become real - when and if man creates robots to do his work for him. Man's mastery of science and technology is advancing by tremendous leaps and bounds. One of his major goals ever since the caveman harnessed an ox to a primitive plow, has been to make something else replace human muscle power. The ultimate "something else" is the robot that acts and thinks like a man. For the robot-powered society described here, Parade enlisted the fertile imagination and scientific knowledge of Isaac Asimov, an associate professor of bio-chemistry at the Boston University School of Medicine and a writer of science-fiction stories, including a series on robots. Wondrous as Asmiov's robotized world of the future may seem, the man who dreamed it up wants no part of it. Says Asimov, "I'll be glad that I will have long since been dead rather than face life in such a society!" In the transportation systems of the future, electronically guided robots will be the bus and truck drivers. There may be robots that can repair TV sets, fix the plumbing, run IBM machines, act as traffic policemen, read galley proofs, serve as "information" attendants at railway stations. "In theory," says Asimov, "there is no reason why any human job cannot be done by a machine if we can invent a robot brain as complex and as small as the human brain. Under such circumstances, there is no reason why a robot couldn't mentally be capable of doing anything a human can. "But who will need man then? Man will die off of simple boredom and frustration." The reason, Asimov points out, is that comparatively few people can be usefully creative. Mr. and Mrs. Jones would have it easy. Their robot butler would awaken them gently, serve them breakfast in bed and wheel away and wash the dirty dishes. The robot valet and maid would choose the day's attire and dress them. "Free" for the day, Mr. and Mrs. Jones must decide what to do. Mrs. Jones doesn't have the drudgery of housekeeping. Mr. Jones has no job to go to, since robots are doing nearly all the work. Of course, he could spend the day tinkering with his sailboat, although he knows a robot could tune u p the auxiliary engine more efficiently. Mrs. Jones may decide to work in the garden. Her robot could do this better, but she jealously guards this privilege. Some people - the "aristocracy" in this strange robot society - would be entitled to work.